Much dyeing has been done this week - I've suddenly had a fright as to how little time there is until the season starts. I kept thinking complacently that I was carrying a reasonable amount of stock from last year, and then it occurred to me quite how much stuff I'd sold on Etsy recently. All good, but it's made a bit of a dent in my supplies. In fact, there's another packet going off to California this morning. Wonderwool Wales - 26/27 April. Back we go to the depths of Wales, and a brilliant time will be had by all, regardless of weather. (Given that we're not camping this year, it's bound to be beautiful). Wharfewool - 10 May. A new little show, just one day, and it's near home too, in Otley. I'm teaching a couple of workshops here. Tynedale Spinners' Gathering - 17 May. The link's out of date,but the details on how to get there are still correct. A small gathering, but with several fibre and equipment suppliers there. And fabulous catering! Woolfest - 27/28 June - the original of all the British wool fairs. Let's hope for good weather this time, especially as we'll be camping again. FibreEast - 26/27 July - down South for us, and there are some really wonderful tutors doing workshops this year. I'm heartbroken I can't manage to fit any in. Yarndale - 27/28 September. We're doing Yarndale again: it would be silly not to, considering Skipton is half an hour's drive away and we can actually STAY AT HOME!! Let's hope lots more spinners and felters come this time, it seemed to be largely knitters and crocheters last year. Bakewell Wool Gathering - 18/19 October. And off to the beautiful Peak District again. I wonder if we can beat last year's record of the amount of Bakewell Puddingss consumed over the weekend (the Bakewell Pudding Shop is within quick walking distance of the show. There are other shops selling the puddings (or even, sacrilege, tarts!) but this is the original and best). I have been meaning to do this for a while, and you can see why. The previous dye recipe book was started in 2008, and there are now lots of older recipes that either don't apply (because I don't have the basic dye colours in anymore) or I just don't use. And towards the back of the book I have scrawled in new recipes any old way, just to fit them in. So, a lovely new book. Once again, I've left the left-hand pages empty - it's useful to have the space for notes and re-writings. Of course, then neat handwriting won't last long. Nor will be it be long until there are a few splashes and multi-coloured smears all over them. Sad, isn't it? First post of 2014 and it's on St David's Day. Oh well, just a little one too. A customer in Scotland had bought a packet of green fibre from my Etsy shop to match and ply with some camel/silk she was already spinning. It didn't match, colours being notoriously difficult over a monitor no matter how careful you are with the image. She bought another packet of a different colourway. That didn't match either. And postage is expensive these days (and shortly to go up, but that's another story). When she contacted me over Etsy and explained, I told her to send me a little sample of the stuff she was trying to match, and I'd see what I can do. It's the green that needed picking out, with a little of the blue-green but not the blue itself. 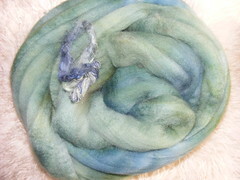 I used white BFL, to get a clearer colour, and picked out the green, with a little shading towards the blue in places. I think I nailed it. I'll try and get it packaged off this morning, but I'm off to try my new trailrunning trainers with the pupz now.